This nest (found on August 4, 2006) is made entirely of large green maple leaves that look fairly fresh. I did not see evidence of rodent droppings or other material inside the box. There were some wood chips in the bottom from the interior of the hole and the wooden door stop to the right of this photo. The box (see below) is mounted on a large tree. See more information on mounting boxes on trees. It is located in Northeastern CT, in a wooded area near a small brook and a Christmas Tree farm. The box is an experimental box that several trail monitors are testing at the request of the designer and supplier. It has a jail-style front porch that I thought might make it resistant to predation by large birds or to use by squirrels. The entrance hole has a rounded edge, and has inside measurements of 1.56" at the widest point, and 2.44" maximum height. A standard Peterson entrance of 1.375" x 2.250." 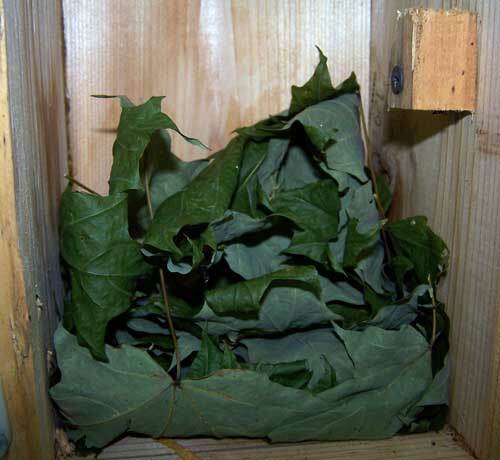 In the first season I tested this box on a tree in northeastern CT, something chewed through the wooden bars. Perhaps vinyl coated metal bars would be more effective. When mounted on a tree, a design like this would not deter a snake of course. For that, a pole-mounted box with a wobbling Kingston Guard would be a better choice. 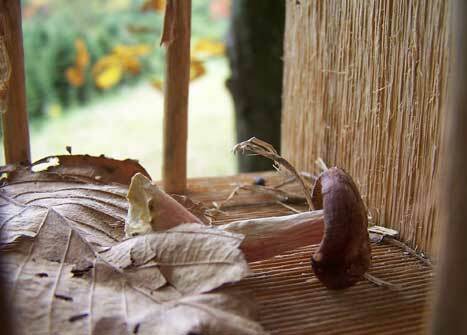 There was a clue on the nestbox "porch" - a mushroom and some leaves. I normally don't mount boxes on trees (see advisory), but recognize that a lot of folks do. Plus I have found Tufted Titmice seem to prefer a tree mounted box. 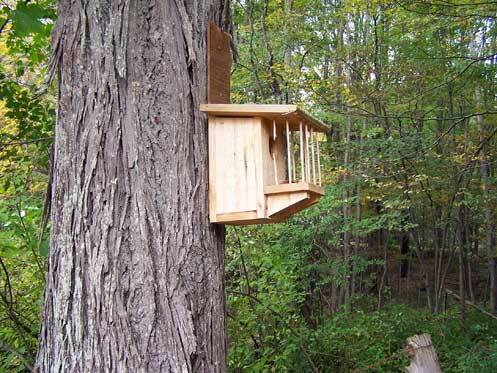 A nestbox design that would effectively deter predators but NOT cavity-nesters would be beneficial. Here is the nest as it appeared on September 28, 2006 (in northeastern Connecticut). There was nothing on the flat grass bottom layer. Notice the sort of arching arrangement of leaves and grass over the grass bed. When I opened the box, I saw the occupant (which didn't flee when I opened the box, or while I stood nearby for a few minutes), so I KNOW what made this. Can you guess? PS: I added the door stop (small block of wood in the middle right), the board on the back, and the plastic closure mechanism to this experimental box. The plastic thing would not deter raccoons, but would keep the box from opening inadvertently. The board above the roof was also added to facilitate tree mounting. 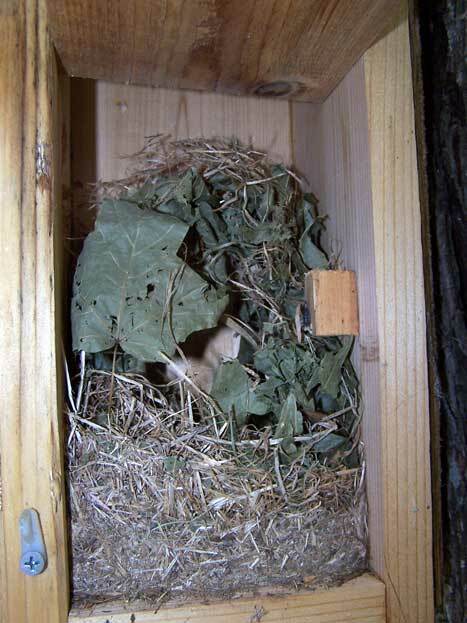 Testing in different parts of the country and under different conditions is an essential part of nestbox design. ...over our heads will float the Blue Bird singing of beautiful and impossible things, of things that are lovely and that never happen, of things that are not and that should be.